LogicMelon is an award winning, multi poster technology platform. Our solutions are utilized by staffing agencies and HR departments around the world. We service our client base from offices located in the US, UK and South Africa. LogicMelon strives to deliver cutting edge, customized solutions to the recruitment industry. No two solutions are the same, as a recruiter’s challenges differ based on industry, company size, and overall recruitment strategy. Writing a job advert can be the most time-consuming part of the recruitment process, especially when you are posting it to multiple job boards. LogicMelon is there to simplify this for you by allowing you to enter the job requirement once on a simple posting form, available directly from within Bullhorn, and then distribute your advert to your chosen job boards while making sure the job still has the best chance of being found by candidates. Writing that perfect advert is easily achievable when using LogicMelon, which features a state-of-the-art HTML editor and multi-lingual spell checking. 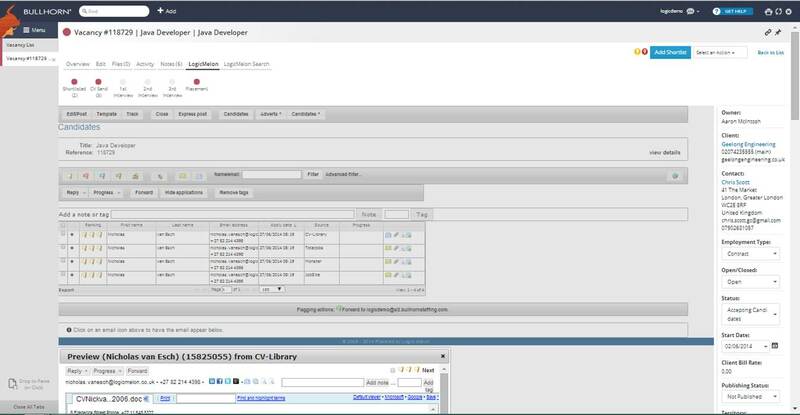 Removing your job from the job boards can also be done via Post, with its simple job deletion process (job boards permitting). Post has been tailored to fit the job board’s needs, making sure your adverts always gain the best coverage possible on each of your chosen job boards. You will only see the fields that are relevant to the job boards you have selected. Post all your jobs straight to your own company website at the same time as your advertising on job boards. As long as your website can be integrated, this will help you advertise your jobs quickly on your own website. LogicMelon supports thousands of job boards worldwide. LogicMelon can set up a feed into your own recruitment website. 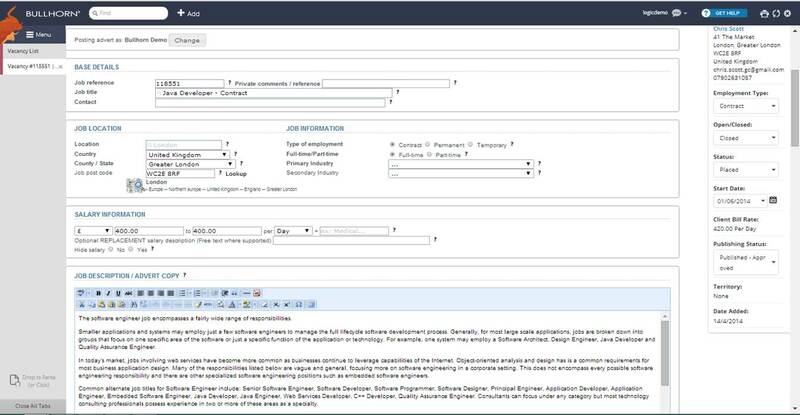 It works just like any other job board selection option – if desired, it can be the default selection. This will keep your own job listings as updated as possible to capture the best candidates visiting your website. Getting the most out of your online job posting has always been difficult. However, with LogicMelon, you are able to view, rate, short list, and reply to candidates from within Bullhorn. 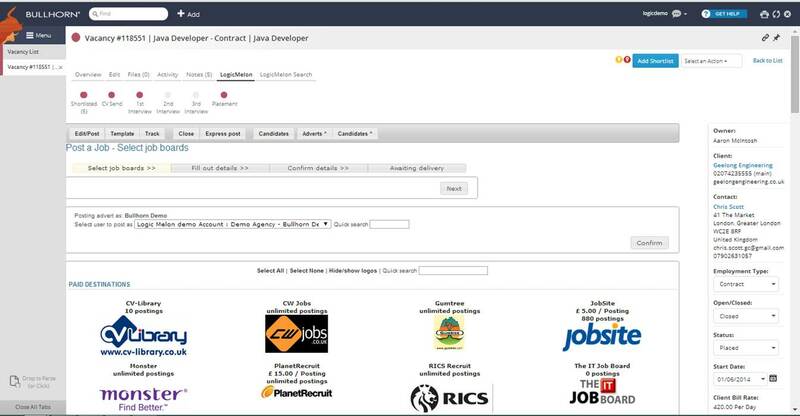 This will enable you to gain the information required to see which job boards are working for you and your company. LogicMelon will be able to supply you with information you have only dreamt of: whether it’s showing you which job board is sending you the most candidates or how much it cost you to hire a candidate, LogicMelon has the answers. However, it’s not always about the quantity. When you start rating candidates, you’ll be able to see which job board is supplying you with the most suitable candidates. If your email crashes, you will be safe in the knowledge that all your applications are safely stored on LogicMelon.